In order to gain access to the TEFL industry, there are many types of TEFL certificates, such as weekend courses, online courses and face to face courses. However, there are only two accredited key qualifications – the Trinity CertTESOL (Certificate in Teaching English to Speakers of Other Languages) and the Cambridge CELTA (Certificate of English Language Teaching to Adults). What is the difference between CELTA or TEFL or TESOL? The Trinity CertTESOL and CELTA courses are the only accredited TEFL courses which are recognised by both the British Council and employers worldwide. The qualifications and recognition are exactly the same, the only difference is is that the CELTA is accredited by Cambridge University and the Trinity Cert TESOL by Trinity College London. Other TEFL courses will not have the same credibility, therefore may not be effective in helping you to start your career as an EFL teacher. Find out more by reading our blog post: What is the difference between Trinity CertTESOL and Cambridge CELTA? At our centre we offer 4-week and 8-week Trinity CertTESOL courses and Teacher Development courses. Why shouldn’t I just do an online and/or weekend course? First of all, most employers don’t accept online or weekend TEFL courses. There is one simple reason that makes studying in a school the right option: PRACTICE! We provide daily Observed Teaching Practice hours with real students, allowing you to put everything you have learned into practice and the feedback session you will receive after every lesson from both your peers and your tutor means that every day you can work on improving your skills and specific target areas. Ultimately, taking an online/weekend TEFL course is unfair to you and your future students. Future employers look favourably on a high amount of practical experience as giving all these practice lessons helps enormously when you’re standing in front of your first real class! Yes, it is. We offer the Trinity Cert TESOL course which is validated by Trinity College London and recognised by the British Council and employers worldwide. Credits are also awarded towards degree programmes offered by universities in the UK. Why should I choose your course? 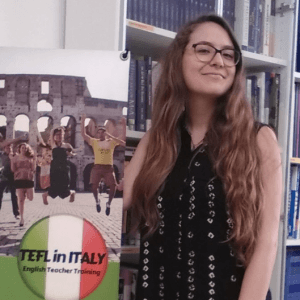 There are at least 9 good reasons why you should choose our Trinity TEFL course in Rome, take a look! Our 4-week course is intensive; there is a lot to learn in a short period of time so that you leave our school best equipped to be confident in the classroom. The part-time course is still intense but less demanding. We suggest this solution to those who have some other commitments or need some more time to study. You can expect to follow a basic daily routine: Teaching practice, feedback time, input sessions and guided lesson planning. Please note that you’ll also need the evenings and weekends to work on your assignments and lesson plans. Have a look at our full-time Course timetable and graduate testimonials to get a first hand account of what to expect from the course. Can I study a TEFL course if I’m not a native English speaker? Yes, you can! In our experience, non-native speakers can become excellent TEFL teachers as long as they hold a high level of English. In fact, there is an argument for suggesting that non-native speakers are often better TEFL teachers than native speakers because they are able to use their experience of learning English as a second language to empathise with their students. Do I need to be able to speak Italian? No, Italian is not a course requirement. In fact, our TEFL course requires that you speak only English while giving your practice lessons to ensure a feeling of immersion for the students and to increase their overall exposure to English. If you do speak Italian, it is a valuable skill in the classroom because it allows you to understand and anticipate your students’ mistakes. I am already qualified, will you help me find a job? If you have not taken the course with us, unfortunately we cannot help you as it would be unfair to those who receive their certificates with us. For this reason, we only provide job guidance for our own trainees. If you are looking to develop your skills, keep an eye out for our speciality courses. Where can I teach with my TESOL certificate? In Italy, you can teach in any private institutions, such as language schools, bilingual schools and international colleges. At language schools you will mainly teach adults, but you can be required to teach children and teenagers as well. In that case our Teaching Young Learners Course might be interesting to you. In addition, you can work as an in-company teacher and there´s a big market for private classes. You cannot, however, teach in the public schools in Italy. This is because the selection process for teachers is carried out by the state and requires a university degree as well as passing of a state exam. If you are looking outside of Italy for work, always check the requirements for public education employment. How much is the average salary for an English teacher in Italy? The average wage for a full-time English teacher in Italy is between €1100 and €1500 net per month. When do schools look for EFL teachers? The biggest hiring times fall between August and October and again in December and January. There is also a surge before summertime (April to June) where schools begin looking for EFL teachers for summer camps and intensive language classes. That being said, we are always receiving job openings throughout the year, so any time is a good time to get certified. Do I need a visa to study and work in Italy? If you are a citizen of an EU country, you are free to study and work within the EU without requiring a visa. If you are a student from outside the EU area, you can apply for a 3 month tourist visa, and you are free to study during this period. As it´s quite complicated for non-Europeans to obtain a working visa for Italy, you could apply for a student visa which allows you to work up to 20-25 hours per week. Min 20 study hours/week are required. This means you´ll need to sign up for our Teacher Development Course or for example an intensive Italian course after your TESOL course. Non-EU citizens should check with their local consulate to find out the specific requirements and/or paperwork they will need.